. . . no small feet: THIS IS NOT A DORM! Here it is . . . the post you've been waiting for. Thanks for tuning in to the minor frustrations that I shared over the last several days. It seems these go hand in hand with living with a college student over the summer. Lad has made life 'interesting' since he re-entered our home mid-May, but last week he pushed the envelope too far. 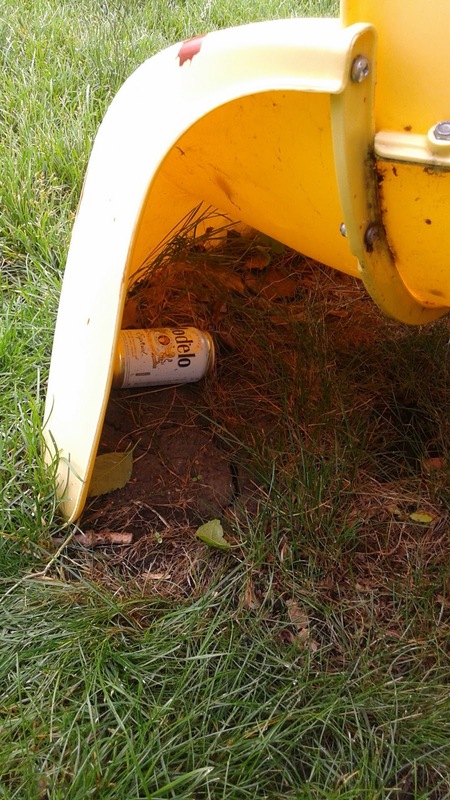 Ah, the lone beer can abandoned under the slide of our backyard swingset. Leftover from the bonfire we told Lad he couldn't have. I didn't think to grab a photo of this previously when I posted some of his earlier summer infractions. 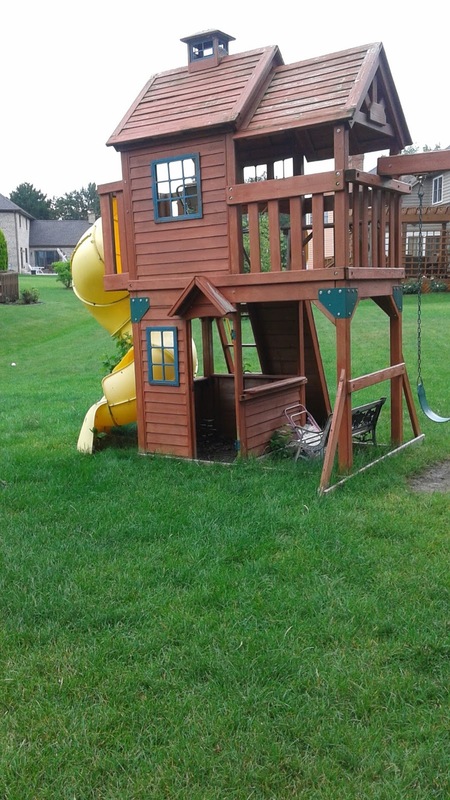 It still makes me chuckle to imagine Lad and his buddies scurrying under the bit of shelter offered by the fort of the swingset. Such a bummer that the bonfire he attempted to pull off without permission right under our noses wasn't more successful. Thank you rain! Wednesday night Lad came home from water polo practice a little after 9 pm. He sauntered up to where I sat nestled between mounds of laundry (that may have outweighed me) on the couch, where I had assumed my regular position of sorting clean clothes for the masses. 'So, some of my friends are going to hang out at Tom's house because it is Tom's birthday today and mine is on Sunday. So, can I go?' I surmised that this sounded like an opportunity to drink beer, in which case I didn't want him driving. He had already worked this detail out with Eddie. Eddie would drive him over and return to get him if he couldn't get a ride home. Sounded responsible, right? Coach pointed out to Lad that he should probably plan to arrive home around midnight, since he had traffic court in the morning. (Yes, this apple doesn't fall far from the tree . . . he was pulled over for speeding over Christmas break and we had the court date assigned to the summer when he would be home from college because he wanted to request supervision. Um, in case you haven't read about my led foot, then this might interest you, or if you don't want your image of me to be tarnished then don't bother). Ed dropped Lad off at his friend's house and I proceeded to sort laundry for the next 3 hours. I occasionally took a break in order to help Ed dry his cast with my hair dryer. The cast got wet during his first attempt to practice water polo despite the pricey cover I bought for it. When I went to bed at twelve, I told Ed to text Lad and remind him that Coach wanted him home right about now. I rarely sleep in, so imagine how excited I was when I realized that it was 7 am. My small celebration ended abruptly when Coach whispered, 'Well, I guess I'm glad that I didn't wake you up then.' What? Wake me up? For what? 'Lad'. Oh no, Lad! Apparently at 4:50 am, Coach heard Lad moaning loudly from the first floor bathroom. He was in the shower. Coach and I have reversed our roles. Back in the day, as in the breastfeeding, bad-dream, I-think-I'm-going-to-be-sick day, I heard EVERYTHING during the night and Coach conveniently suffered from middle-of-the-night deafness. 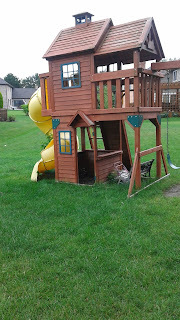 Nowadays, I am dead to the world and Coach hears kids come home, garage doors go up, and apparently early morning showers accompanied by moaning. I jumped in the shower to get ready for court, and left Coach to go wake up Lad who was apparently sleeping on the couch in the family room. We agreed that I would accompany our oldest to traffic court. This made sense seeing as I have more experience under my belt in this department. Not proud, just saying. Our planned departure of 7:30 am was cushioned with extra time, and I could see when I got to the kitchen that we were going to need more than just a cushion to survive this morning adventure. Lad was pulling the couch apart in the family room when I entered the kitchen. Coach just shrugged at me. 'I can't find my phone,' Lad grumbled before he sat down to eat. A minute later he stumbled to the bathroom to vomit when his oatmeal wouldn't go down. Oatmeal, seriously? Reggie and Curly were eating breakfast and preparing to go to swim team. Their eyes grew wide, and Curly expressed some sympathy for her 'sick' older brother. I cleared that confusion up in a hurry. 'He's not sick. This is what happens when you drink too much alcohol.' Those wide eyes grew a bit wider. I crossed my fingers. Please be so outraged by this that you skip right over this kind of nonsense when you are older - I thought to myself as I looked at my sweet, innocent smallest son and youngest daughter. But wait, there's more . . . with Laddie, there's always more . . .